The tune I bring you today is something I picked upwhilst digging in the New York hinterlands. While I certainly knew who Merrilee Rush was – i.e. singer of ‘Angel of the Morning’, a huge hit in 1968 – I had no idea that she had ever recorded a version of the Four Tops ‘Reach Out’. My obsession with Pacific Northwest rock had clued me in that Rush hailed from and had started her career in Seattle. What I did not know (and what would have explained the AGP 45) is that she recorded ‘Angel of the Morning’, in Memphis with famed producer Chips Moman at the dials, and the American Studios group playing. 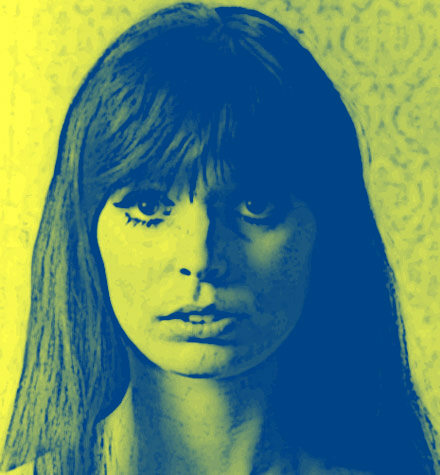 Following her hit with ‘Angel…’ Rush signed with Moman and the AGP imprint and recorded a series of 45s in 1968 and 1969, before moving on to Scepter Records. I picked this 45 up out of curiosity, but was very happy indeed when I finally got it home and gave it a spin. Unlike the placid pop of ‘Angel…’, Rush’s take on the Four Tops hit seems as if Rush had been marinating in the Vanilla Fudge version of another Motown classic, ‘You Keep Me Hangin’ On’. You get the fuzz guitar, organ, a fairly restrained horn section and plenty of busy, Appice-like drumming. The overall effect seems aimed at the psychedelicized listeners (though the oddly warped sounding organ at 1:54 sounds like a mistake), especially the fact that the track stretches out to nearly five minutes! I’m inclined to attribute any lysergic effect at the feet of the studious, flexible American Studios crew, who were able to tap into (and channel) the zeitgeist without experiencing any of it directly, i.e. why reinvent Vanilla Fudge when a room full of professionals can whip up a satisfactory simulacrum? 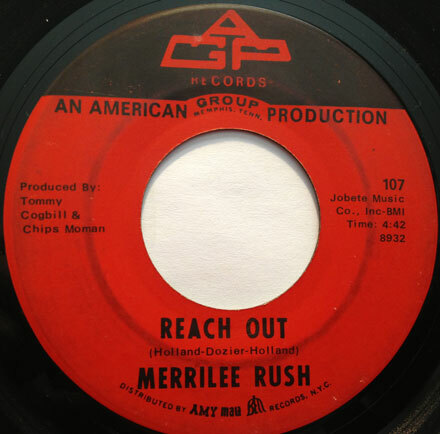 ‘Reach Out’ seems to have had some small measure of success, charting in the Northeast and a few other regional markets, but it would be Rush’s second to last hit (with ‘Everyday Livin’ Days’ her last, and much less successful entry a few months later). Rush would continue to record into the 1970s. You can get this track, and her other AGP 45s on the Rev-Ola reissue: Angel of the Morning / Comp Bell Sides . Welcome to the new week, here at the leg of iron (not as delicious as leg of lamb, but it’ll do). The track I bring you today is one of those numbers that dropped intoi my ears via a Mr Luther mixtape back in the olden days and lodged itself deep in my skull. I kept my eyes peeled for a copy for many (many) years, until a few months ago one popped up on a sales list and I grabbed it forthwith. 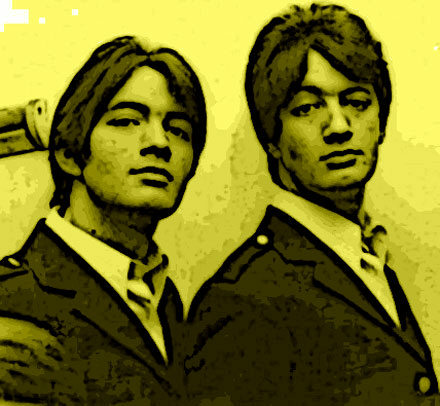 The artists are Paul and Barry Ryan, who have appeared in this space before (more on them here) with a number of tracks from their excellent 1968 UK LP ‘The Ryans’, most especially ‘Hey Mister Wiseman’, quite the delicious slice of freakbeat. On that particular tip, is the record I was referencing above, which is not coincidentally this week’s selection, ‘Keep It Out of Sight’. 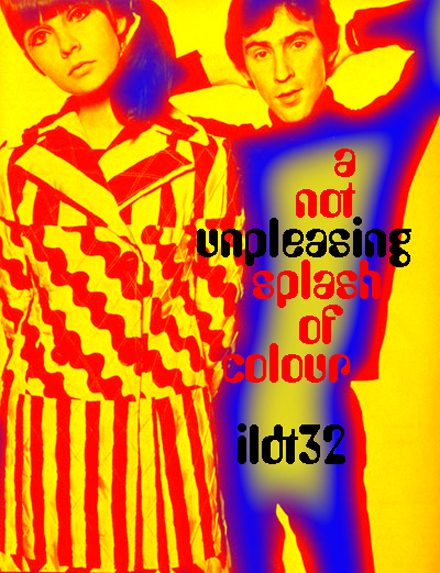 Released in 1967 in the UK on Decca (where it made it into the Top 40) and on the US on MGM, ‘Keep It Out of Sight’ is also freakbeaty, big and bouncy, with plety of rock, but also enough Carnaby Street freakery on the fringes to keep the flower children pleased. In a special bit of extra credit bonus-ery, it was also penned by none other than Cat Stevens, who was – at the time – working the same side of the stylistic street before stepping out of his brogues and into some bare feet for a successful run as a gentle soul. 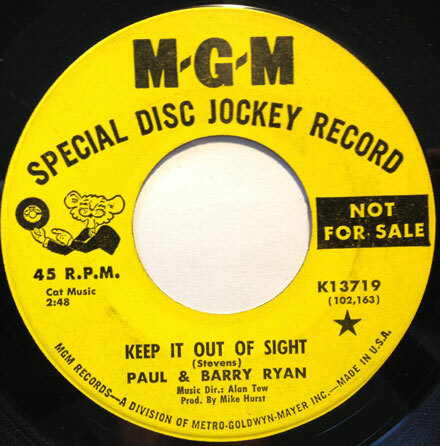 ‘Keep It Out of Sight’ has a very groovy arrangement (by library composer Alan Tew) mixing acoustic guitar, swirling strings, fuzz guitar, castanets, seagulls (yes, seagulls) and some particularly nice electric bass. It really ought to have been a bigger hit, but it wasn’t, so you get to dig it now and lord it over the cool kids at the record hop (not really). That said, I hope you dig it as much as I do, and I’ll see you next week. I have a very groovy collection of sounds for you this month, with sets devoted to Van Dyke Parks, Manfred Mann, the long lost musical career of Jerry ‘The Geator’ Blavat, and some very cool covers of Tim Hardin songs. In service of my gradual and ongoing rediscovery/appreciation of the Beach Boys, I bring you couple of stellar tracks from one of their later albums. I’ve discussed my feelings about the Beach Boys to a limited extent in the past. I have owned their albums since I first started buying records as a teenager, having worn out a copy of the old 2-LP ‘Endless Summer’ set back in the day. Flash forward a decade, and I’m experiencing a knee-jerk reaction to the ‘Brian Wilson’s a genius’ wave that was around on the periphery of the garage/mod/60s scene. I can chalk up my failure to dig the vastness and brilliance of Wilson’s oeuvre entirely to a combination of ignorance (I hadn’t listened to any of the full albums from ‘Pet Sounds’ on) and undeveloped sensibilities, i.e. my ears/brain were not yet attuned to a more sophisticated variety of pop music. That is a problem I’ve grappled with my entire adult life. Fortunately, the older I get, the more open I’ve become to experimentation, especially with music. In the case of Brian Wilson, and the later Beach Boys, that openness has been richly rewarded. This can all be laid at the feet of Brian Wilson. One of the great musical tragedies of the 1960s, is the area where the creative flowering, and the psychological dissolution of Brian Wilson intersect. Just as he was reaching his creative peak, pushing the band into unexplored territory, he was crumbling. The only good thing about this, is that even though Brian fell into the background, the Beach Boys, especially Carl Wilson picked up the slack. 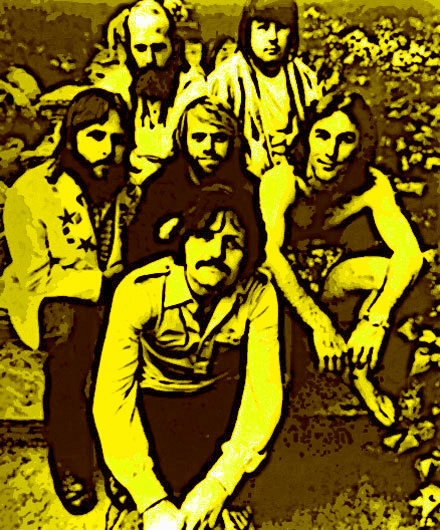 Recorded (for the most part) in 1970 and early 1971 (it was released in the summer of ’71), the ‘Surf’s Up’ album was another in a string of less than successful outings by the band. They hadn’t had a hit single since 1968’s ‘Do It Again’ (from 20/20), and their LPs hadn’t been doing that well, either. Fortunately for us, they were still managing to make quality music. 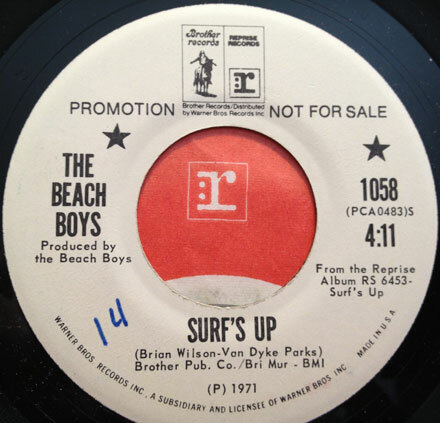 ‘Surf’s Up’, named for the long-dormant ‘Smile’-era Wilson/Van Dyke Parks collaboration that would be finally be completed for the album (using the original 1966 tracks), was the first Beach Boys LP after manager/collaborator Jack Rieley came on board. Though I’d heard of the album, I hadn’t actually heard any of it before I encountered ‘Feel Flows’ on the soundtrack to the 2000 film ‘Almost Famous’. The track blew me away, not only because it was an amazing (new to me) Beach Boys track, but because – like the sounds on 1968’s ‘Friends’ LP – it revealed to me how much of the contemporary music I was digging had been influenced by this era of the Beach Boys catalog. It would be all but impossible not to see the influence of this period of the Beach Boys in the sounds of groups like the Sneetches, Stereolab, High Llamas and Eric Matthews, all of which were in heavy rotation in my ears. 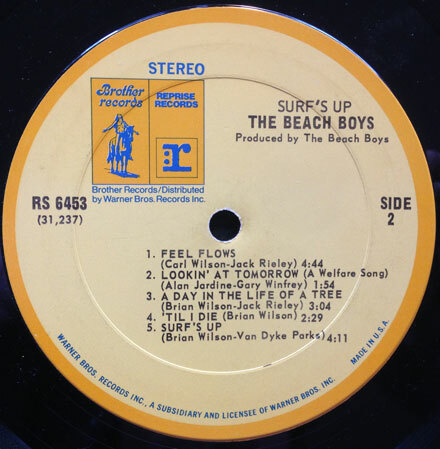 The three tracks I’m including today all hail from the second side of the ‘Surf’s Up’ album, and all feature Carl Wilson as lead (or co-lead) vocalist. ‘Feel Flows’ starts out in a poppy, upbeat vibe, but fairly quickly turns into something different, mixing group harmony, psychedelia and even jazz (Charles Lloyd on flute), with some very cool, distorted lead guitar weaving in and out of the mix. ‘Til I Die’ is one of the most beautiful things that Brian Wilson ever wrote. A kind of existential meditation, wrapped in waves of stunning harmonies, the instruments are almost invisible behind the wall of voices. This is one of those songs that has to be appreciated through headphones, repeatedly, to pick up on all the layers. ‘Surf’s Up’ is one of the most interesting chapters in the creative saga of Brian Wilson. Begun in 1966 for the ‘Smile’ sessions, with lyrics by Van Dyke Parks, the song is a beautiful, impressionistic, poetic work, in which Wilson manages to shake off the Spector-isms of his 1966/67 epics while retaining all the sophistication and beauty of the song. As in ‘Til I Die’, ‘Surf’s Up’ sees the voices coming to the fore, with the instrumentation painting the background. Through the just over four minutes of the song, only the piano in the middle section really makes a statement over the harmonies. It really is quite spectacular and improves with repeated listening. If you haven’t found your way into this era of the Beach Boys, you really ought to give it a try. It took me a while to track down an original copy of ‘Surf’s Up’ (the late 60s/early 70s BB LPs didn’t sell well in the US), but you can grab it all inexpensively in iTunes.